In recent years, interest in non-Western curative techniques among Americans has grown by leaps and bounds. Integrative Body-Mind-Spirit Social Work connects Western therapeutic techniques with Eastern philosophy and practices, while providing a comprehensive and pragmatic agenda for social work and mental health professionals. This text, written by researchers from both Asia and America, presents a holistic, therapeutic approach that ties Eastern philosophy and practical techniques to Western forms of therapy in order to help cause positive, transformative changes in individuals and families. They begin by establishing the conceptual framework of integrative body-mind-spirit social work, then describe, step-by-step, assessment and treatment techniques that utilize integrative and holistic perspectives. Several case studies demonstrate the approach in action. 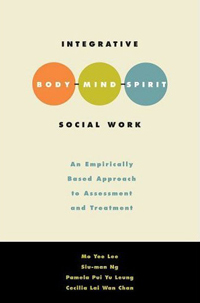 The authors also discuss ethical issues and give tips for learning integrative body-mind-spirit social work. Professionals in social work, psychology, counseling, and nursing, as well as graduate students in courses on integral, alternative, or complementary clinical practice will find this book complements the growing interest in alternatives to traditional Western psychotherapy.